Earlier this month, I headed out to The RTÉ Choice Prize Awards at the jam-packed Vicar Street in Dublin 8, south of the Liffey. Arriving early, we grabbed ourselves a pint of Guinness’ Hop House 13 and took our seats in anticipation of an exciting, music-filled evening. During the course of the night, we were treated to a range of live performances, as well as the announcement of the winner of both the RTÉ Choice Music Prize single and album of 2016. The first act of the night was Wallis Bird, whose yellow-white hair glowed onstage like a beacon of light. Bird captivated the audience with her heartfelt a capella as she stood alone onstage during ‘Home’, the title track of the album for which she was nominated. On another track, she banged against a microphone and used a loop pedal to create a rhythmic and organic backdrop for her incredible lungs. It was a raw and vulnerable performance. In a post-performance interview, Bird recounted the significance of ‘Home’ and living in the house where she first met her girlfriend. Next up was Bantum (Ruairi Lynch), nominated for his album ‘Move’, who I’d had the pleasure of seeing before at the Shortlist Sessions, but the last time I saw him he was alone onstage with his laptop and guitar. This time, he was joined onstage by the singers who feature on his tracks. The first track ‘Feel It Out’ featured Farah, and the second featured Loah and two backing singers on the song ‘Take It’. It made a huge difference with the singers being live, really fleshing out the music, and he looked like he was a lot more comfortable. After the performance, he discussed his love for funk sounds, and how the album was released completely independently. We Cut Corners, who I’d also seen at the Shortlist event, took to the stage next and played a hugely varied set in terms of tempo and sound. Nominated for their album ‘The Cadence of Others’ the duo confidently took to the stage to perform their tracks ‘Middle Kids’ and ‘Of Whatever’. Considering their smart and wonderfully wordy lyrics, you’d never guess the pair are teachers. At one point, the two stood side by side at the microphone, singing a capella with a smoky, moody spotlight allowing their voices to carry over the crowd. Then, at other times, Conall Ó Breacháin was banging one handed against a drum kit with one hand whilst John Duignan was strumming away at his guitar. Next to the stage was indie legends and former winner of the Choice Prize, The Divine Comedy. Neil Hannon,sat at a piano to perform some tracks from his latest effort ‘Foreverland’, Divine Comedy’s 11th studio album, reviewed by editor Mary back here. He and his live band kicked off their three-song set with ‘Catherine the Great’, before playing the witty and evocative ‘How Can You Leave Me On My Own?’ and drawing a number of laughs from the audience. Following The Divine Comedy’s performance, the winner of the Song of the Year was announced. 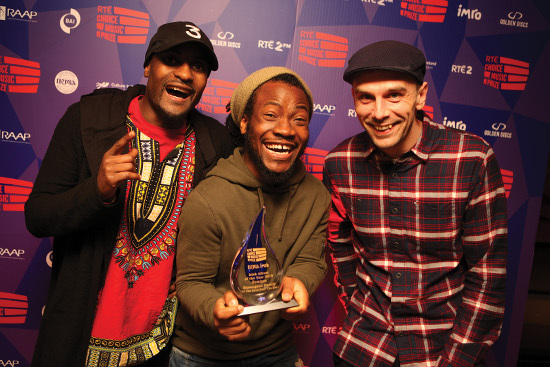 Unable to be there on the night, winners Picture This (winning for ‘Take My Hand’) had recorded a video accepting the award and thanking all who had voted from a studio in the States where they are recording their new album. You can listen to Carrie’s interview with Picture This in Austin after that recording experience here. Lisa Hannigan then took to the stage. It’s hard to explain to someone who hasn’t heard Hannigan sing live just how powerful, yet calming her voice is. Ethereal and waif-like, Hannigan seems to command the stage without really trying to draw attention. I’m trying not to sound like a super fan. Armed with a banjo on one track, and what I believe was a tabletop accordion on another, Hannigan’s album ‘At Swim’ (reviewed by Carrie here) was nominated for the Album of the Year, and she played a few tracks from the album, including the spooky and slow-marching ‘We, The Drowned’ and the folky ‘Undertow’. The sixth act of the evening was the all-in-black Katie Kim, nominated for her third studio album ‘Salt’, whose morose, moody sound I fell in love with right away. Standing at first with her guitar, then moving onto a keyboard, Kim’s unusual and rich sound filled the room, and in particular her tracks ‘Ghosts’ and ‘Day is Coming which are the first two tracks on the album. ‘Salt’ is an emotive and powerful piece of work, and seems even more incredible when considering Kim is a solo artist. A little different to Kim’s haunting melodies, eventual Album of the Year winners Rusangano Family (for ‘Let the Dead Bury the Dead’) virtually erupted into life and had the audience on their feet during their fast-paced set. The title track of their LP opens with the tolling of a funeral bell, before MCs God Knows and MuRli began to do what they excel at, capturing the crowd’s attention with their fast-paced and lyrical verses. Rapping about Irish identity and asylum seekers, they engaged the crowd by dancing and jumping enthusiastically throughout the set, even joining the audience out on the floor, while DJ mynameisjOhn was at the decks. After just a few minutes of their performance, former TGTF contributor Tom turned to me and said, “I want these guys to win”. Then we had All Tvvins, the enigmatic indie pop duo Conor Adams and Lar Kaye, nominated for their album ‘IIVV’, which Adam reviewed back here. They started with the catchy ‘Thank You’, a track with a seriously addictive guitar hook. Up next they played ‘These 4 Words’, followed by ‘Darkest Ocean’, receiving huge cheers from the audience. Bouncing around the stage, the pair looked like they were having a great time. The final act of the night was Overhead the Albatross, nominated for their album ‘Learning to Growl’. An instrumental-only act, live they have what seemed like 6 million guitars, a drum set and a violin. They finished up with a well-earned standing ovation and certainly deserve some real props for making instrumental-only music so interesting and feel so accessible. I’m going to be honest, I couldn’t tell you what tracks from their nominated album were played, but they were certainly impressive with a mixture of funky rhythms, moments of slower paced violin solos, and with an evident passion for the music that they were playing. All in all, we had a pretty spectacular night. It was great to catch a glimpse of what the all too underrated Irish music scene has too offer. Perhaps underrated isn’t the best term, as the people that I’ve spoken to in my newly adopted home can’t help but rave about the music that is out there by Irish artists. This is music too often under the radar in terms of the global picture aside from the occasional artist that will break through: Hozier jumps to mind here. I can definitely say that I’m excited to see what’s in store for the future of Irish music, particularly now that I’m able to access more of it living on Irish soil. If the eclectic and talented mixture of music that I heard at Vicar Street is any indication of the variety of music there, then I’ve got high hopes for the music that I’m going to be discovering over the coming months (maybe even years) now that I’m rooted here in Dublin.